Remixing Unmixables – Toni's Remix Blog. I picked these specific blog posts because I think they are reflective not only of readings and what’s covered in lectures, but also of my own ideas and thinking afterwards. I really enjoyed this class and felt that I really improved as the semester progressed, not just in remix skills, but also in the way I thought and approached each topic. This class really exceeded my expectations about what it would be, and I really think these posts reflect my enthusiasm. For this final remix video assignment, I really wanted to delve creatively beyond the parameters of my previous assignments. Looking back I am pleased with them, however I believe them to be viewed more as ‘mashups’, all of them are recognisable. For this assignment, I wanted to really pursue my creative limits and make something extending beyond the borders of what I have done before. I want to make something unrecognisable and indistinguishable. I believe I have done this. At the beginning of the creative process, I found very early on that I had hit a roadblock. I struggle when somebody says “you can do absolutely anything”, endless possibilities float around in my mind, and I find myself unable to grasp onto one idea. Hugh advised that if I just begin- something will form along the way. Remix is essentially just experimentation, something will work, and others will not. Often a form begins to take place once the progress has actually began. I decided to take this advice, and began playing around with the form of some smoke I filmed myself driving through on a trip last year on ‘Final Cut Pro’. Mirroring the smoke from the middle and flipping the image, I was really pleased to see the picture transformed- the patterns made from the trees and the smoke shaking with the handheld camera had a kind of mesmerising effect. I decided that this would be a good base point to begin with. The whole process for me was quite trial and error based. If something didn’t work, I tried something different. After a while I really became inspired by the whole ‘kaleidoscope’ effect of flipping and mirroring images into unrecognisable moving patterns that dance before the eyes. All the video imagery used is my own material, a built up combination of things I have filmed over the years (particularly holiday footage). I played extensively with layering and overlapping film. I knew that I could easily just download a kaleidoscope kind of pattern to combine with my imagery from the internet, however I was really interested in the patterns my images were creating themselves, so I decided to focus on creating a kind of similar effect entirely by myself. This ainly via changing the blend to ‘colour burn’, and adjusting saturation, exposure, and colour adjustments with final cut pro’s ‘colour board’ tool. Often I would also adjust the opacity to a level that combined layers to good effect. Once I had my clips arranged in a way I was pleased with, I would detach the audio and delete it in preparation for the sound part of the project. For the audio part of my assignment, my Audacity skills were once more put to the ultimate test. I fiddled between each track for a while, adjusting tempo, pitch and speed until I was pleased with the kind of ambient chaotic sound my speakers were emitting. I worked really hard on adjusting each track to a point where they sound very different from the original, because through the chaos, I wanted the specific layer the listener is focusing on to kind of stand apart from the others. At various points during the overall audio track, the overpowering layer switches and changes to another. Overall I used three tracks, and five layers (in some cases, overlaying one layer of one track with the layer of another part of the same track). I had a lot of fun effecting each individual track- adding echoes and removing vocals. In one instance, I completely reversed a track so that it played backwards, and I was so happy with how great it sounded. Once I was happy with how the tracks were layered together, I added various fades and focused on volume. Whilst playing around with the audio I had to keep in mind the imagery, so a lot of the time I would toggle between the two programs testing the audio out as I played the visual. Overall I feel like I have achieved my goal of creating something a little beyond the boundaries of my previous assignments, and I am really pleased and proud of this work. It was a lot of fun to create! I am really pleased with the final product of this assignment and believe that it would survive copyright interrogation. First of all, all imagery in the work is indeed of my own original content, sourced from video archives I have collected over the years on my own personal hard drive. Most of the footage was captured over a series of three family holidays. The only instance in which I would have been at risk of breaching copyright is a clip I used towards the end taken from a Japanese Wallpaper gig. I used the clip because I liked the effect of the overlaid flashing lights, and made sure as I merged the clip with the other, that the audio was deleted, and that Japanese Wallpaper’s figure was unrecognisable and almost not even present. If at risk at all of breaching copyright, it would be through the audio as none of the sound used was originally my own, nor was it sourced from a free sharing space online. I will however defend the work, as I believe that I have manipulated the sound to a point where it is virtually unrecognisable as anything other than the work I have created myself. I believe it has been adjusted to a point where it is nothing but my own creation and it has consequently evolved to a point where it is undetectable as the original content (I tested this theory myself using Shazam). Also, before uploading the assignment I showed at least five different people, all who were unable to distinguish the original audio tracks I usedIn the world, nothing is ever completely ‘new’ and ‘original’, especially not in remix culture. In remix culture, content is evolved to become ‘original’ by the artistic expression of the new creator. I believe I have adapted the sound enough to enable this newfound originality. I have taken content from three tracks, all occupying different genres and themes within music, and mixed them together, transforming not only how it sounds, but the messages within each piece. What I have created is new. Finally, I wish to indicate that should anybody disagree with the above, I am still well within the borderlines of Australia’s Copyright Act of 1968 (2-5), as my work is fair dealing for the purpose of research or study. I completed this work as an assignment for my university subject ‘Remix’, and have no desire to use it for financial gain or value, and have utilised under 10% of the original content. The Copyright Licensing Ltd v University of Auckland supports these claims, where the High Court of New Zealand decided that the University of Aukland was wrong in charging students for copyrighted study material, breaching ‘fair dealing’ as the university was making money off of copyrighted material distributed with the purpose of study. I have evidently made this film for the only purpose of university study and have no desire to use it for financial gain, therefore I believe ‘fair dealing’ has not been breached. The reappearance of a suppressed or forgotten memory which is mistaken for a new experience. This term pretty much delves from the idea that no idea is ever completely original. Every story has been told, every possibility explored; new ideas are simply reincarnations and mashups between old ones that have been repressed at the back of our minds. An idea that one may think to be a completely new revelation may be the result of an occurance of the past, fragments and ghosts of memories forgotten coming back to haunt us. The same theme may be explored in a varying number of ways, however very often, different ideas share similarities. One story may be likened with that of another. Attributes from one form may be shared unintentionally with that of another. This is why people complain that ‘everything on TV is the same’, and this is true. More often than not, new content is simply a new variation of older content. Stories that sell are re-used and adapted. Sometimes this is done intentionally (it is an industry after all), however lots of the time it is completely unintentional. Trying to consider a moment in my life where ‘cryptomnesia’ has come into place, I am stumped. I guess though, that it’s all about meaning of the word. Instances and memories forgotten have been repressed, only coming to play through the present. The term makes me think of the movie ‘Limitless’, where Bradley Cooper’s character takes a pill and is suddenly able to access the parts of his brain containing the experiences he has repressed over his life. Cryptomnesia is extinct within his mind. That however, obviously, brings with it a whole lot of new problems. So yesterday I was driving home from university in my car with the radio on listening to Triple J’s ‘Veronica and Lewis’, who were encouraging people to send shady text messages to each other, screen cap them, and send them into the station. Why? To help out our government on their first official day of ‘monitoring’ our communication platforms (like they weren’t already being monitored.) Australian telecommunications have been required by law to store customers’ data for a period of two years. Our metadata is the target, which will in turn, expose the communication patterns of the population. The segment on ‘Veronica and Lewis’ was quite entertaining, people sending in shady text messages to the standard of ‘see you later at training, it’s going to be a ‘blast’. hit them ‘sky high’.’, etc. Ironically, it was Malcolm Turnbull himself who had previously been campaigning for ‘individual rights’, arguing that it would be “wrong in principle”, and that terrorists would be able to “easily get around it“. It’s interesting that now, only two years later Turnbull has found himself backed into a corner, to create the data retention scheme that was officially introduced as of yesterday. SO WHAT WILL BE RECORDED? Telcos aren’t going to keep a record of your wake-up time or the song you played in the shower but there will be pings of your phone’s approximate location as you access the internet to check Facebook. WHAT’S RECORDED: Every email you send will have some information recorded about it. Not your message, but your address, the recipients’ address and the time it was sent. There are two official reasons to introduce this official collection of metadata. – Use applications that send messages via the internet, and encrypt them. The provider will know you are using the app, but not who you have contacted. – Learn about what’s changed, and become tech savy. Keep up to date with new resources. Who knows, this blog post itself might even get flagged. When I think of brandalism, I think of Banksy. And who doesn’t? Banksy; the ‘alternative voice’. His art brings power to the artist. A critique of political/social convention. 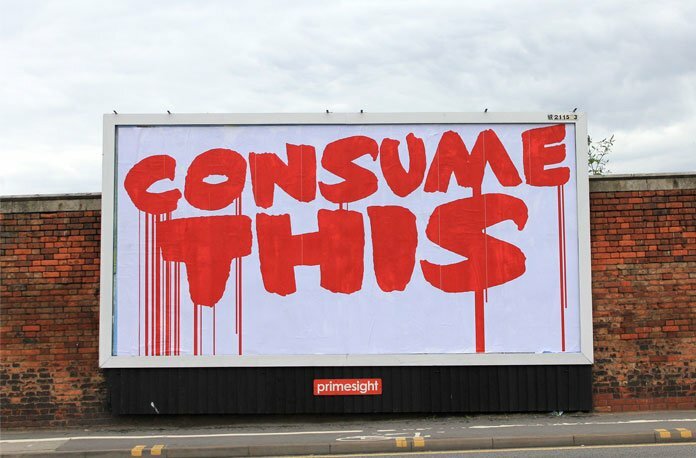 A quick google of ‘brandalism’ brings about a wikipedia page speaking of the ‘movement founded in July 2012 in London’ where a group of artists covered billboard advertisements with their own monochrome art evoking an ‘anti-advertising sentiment’. While I guess this does sum up what ‘brandalism’ is, it’s interesting that the page only focuses on this particular circumstance. Through remix, artists are handed the perfect tool to transform something in order to evoke a new meaning (often satirical or ironic when considered with regard to the predeceasing work). Works are republished to the consumer creating new ideas, and a completely new way to provide societal commentary. RECUPERATION: The process in which politically radical ideas and images are re-developed into the media culture. How ideas are expressed to others through the form of media. DETOUREMENT: Reversing the idea of recuperation, turning logos/adverts/ideas on their heads into something with a shifted meaning that is instead, against the original message. I think that it is particularly interesting that ‘brandalism’ is often associated with activist rebel groups and has such negative connotations, when it is all around us all the time – often unnoticed. Especially regarding the history of media propaganda, even only in the last century. There is no need to watch the entire clip, a minute or two and you will get the gist of the scene, but the taboo regarding graffiti and ‘propaganda’ reminds me of this scene from ‘Wayward Pines’, where the ‘creators’ wish to exicute a graffitti artist for disrupting the town’s order. For going against convention and ‘rules’. And this is Remix. This. Is ‘Culture Jamming‘. Matt and Alex Live Remix Off- Questioning Copyright. On the topic of remix and copyright… I found this video not only extremely cool and entertaining, but also extremely relevant if you watch it all the way to the end. Triple J’s Matt and Alex had a ‘live remix off’ in the Triple J studio, where Matt won by default because Alex’s remix (shown in the video) breached copyright. Today we got talking about remix being present in pottery and mosaic, and I was immediately reminded of a school excursion I took in primary school where one of the activities was to create a mosaic piece from pieces of broken plates and pottery we smashed to pieces ourselves. In my head I don’t even remember the location of the excursion, nor the room I was in. I do however very vividly remember the art itself. I loved sifting through the pile of broken tiles on the floor, searching for anything colourful to create my own art with on a square tile I was given. Once completed I gave the work to my mum. I remember being so fascinated with the concept of destruction, hitting the hammer on the china and destroying complete objects until they existed only in pieces. This process of course is simple in terms of reference. ‘Recycling’. Taking something, destroying it to the point where it loses meaning in purpose and form, and re-shaping it into something completely different. I immediately got thinking, trying to put this experience into context. Where was this excursion? It’s funny. As soon as I concluded that it was some sort of museum, Hugh began talking about the remixing of religions and culture in history. Completely mirroring my thought process. Religion of course, has metamorphosed through the ages. Most religions are after all, simple (OK, maybe not simple) hybrids of one another. Regions transform and people ‘swap’, re-inventing themselves, re-inventing religion, and re-inventing culture. During the Rule of Emperor Constantine, it was decided that the concept of the many gods the people held accountable for the universe was too ‘complicated’ a belief. In turn, it was decided that the many gods should join together into the one Christian god, that people should worship one instead of many. So Christianity became the official religion of the Roman Empire. A remix of culture. Ironically, religious art has been documented throughout times on clay-made pottery. Much of which was later smashed up; rebirth in the form of mosaic. Approaching this assignment with a completely blank mind in terms of what I want, I decided one of the simplest/most effective parts of remix that I love to see, is the effecting of movement. A few days earlier, Montaigne uploaded footage of herself dancing on her Facebook page and I remember thinking that it was perfect. My challenge towards myself was to limit my pressing of the undo button to only six presses (six being my favorite number). I decided upon this rule so that my own focused ‘nit picking’ would not overcomplicate the process. I also want this assignment to be beyond the conventional. I don’t want my result to be ‘ neat’ and ‘pretty’, I want people to be able to see that I have experimented. I also do not want to do this entire assignment in one sitting as I am in different frames of mind each day. I want to impact this work gradually, and I want it to remain ‘fresh’. I downloaded the clip of Montaigne dancing by herself in her family’s house and immediately manually balanced the colour so that the image became more clear and resolved. I decided I wanted about a minute’s footage, so I trimmed sections at random and overlaid them, changing their opacity so that multiple clips were playing and visible at once. Once I was happy with the complexity of the layering, I changed the duration times of selected overlays, speeding some up and slowing others down. When played together, I am extremely pleased with this effect. A few overlays seemed too close together, so I also flipped and dragged a few on the screen. During this process I tried to press the play button as few times as I could. Once I was happy with the overall vibe I had created, I individually selected each clip and manipulated the colour effects quite drastically. I had no real process when it came to this, I simply dragged the dots around not paying attention to what I was doing until I was pleased. 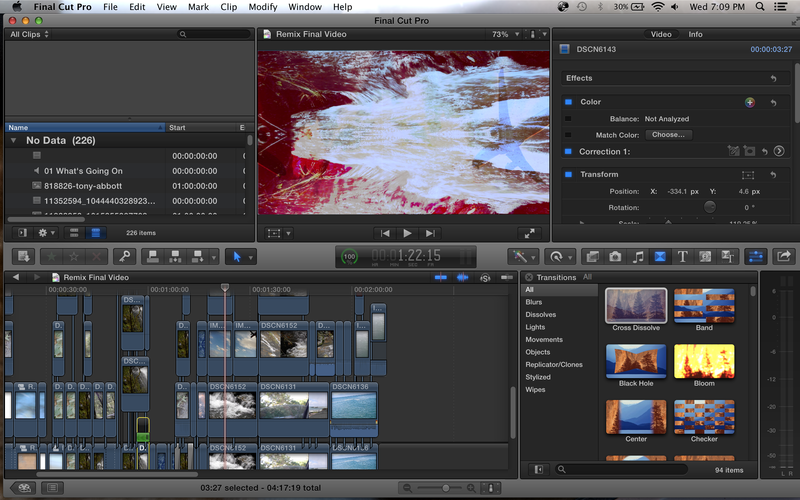 Beginning to think about the audio, for now I am happy with what the clip sounds like with no manipulation. We will see what happens next sitting! Watching back the progress I decided that a little something was missing, so I downloaded various clips of birds in flight off YouTube and overlaid them into various areas of the work (changing colour masks and cropping to see fit). After adding a slow motion effect to only the bird clips, the fluid movement of the birds when paired with all the layers of dance seems to have a soothing, harmonizing effect, transforming the original footage all the more. In 1991 Negativland released a single with the large title ‘U2’ displayed on the packaging, and ‘Negativland’ in a much smaller font. U2’s Island Records label sued Negativland in response for violating trademark law. Negativland argue that their use of U2’s and others’ material falls under the fair use clause, and released a book and CD package titled ‘Fair Use: The Story of the Letter U and the Numeral 2, focusing on the lawsuit.